For all the buzz around virtual reality technology, some children’s brands are working more on ‘immersive reality‘ – real-world experiences like theme-park rides, amusement parks and hotels. 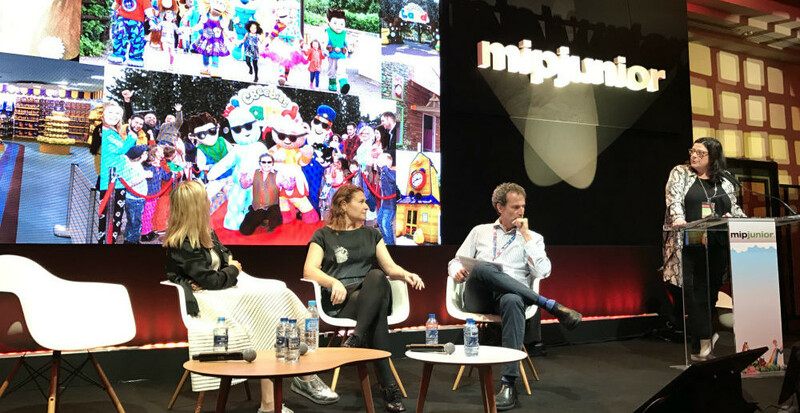 A panel session this morning at MIPJunior explored some of these experiences, as well as picking its experts’ brains on virtual reality. The panel comprised Henrietta Hurford-Jones, director of children at BBC Worldwide; Catherine Fulton, creative director for marketing strategy and engagement at Viacom Media Networks; and Helen Juguet, VP of business development, TV and digital production at Ubisoft. The moderator was David Kleeman, SVP of global trends at Dubit. The second trend: parents remain very important for children in terms of the brands they choose to interact with. 70% of kids surveyed by Dubit say they choose content that their parents approve of, while 81% choose content with characters that their parents know. “Parents and kids are looking for shared experiences,” said Kleeman. CBeebies Land includes rides – “they’re not screaming, white-knuckle rides!” – as well as ‘touching and feeling’ experiences like a garden based on the Mr Bloom character, and other zones based on CBeebies’ brands. There are guest appearances from popular characters, which Hurford-Jones said creates great joy for the visiting children. Fulton spoke next about what Viacom is doing. “We really know that when fans love something, they want to own it, see it, share it, co-create it,” she said, referring to Nickelodeon’s live theatrical events like a SpongeBob SquarePants musical, retail spaces and resort spaces in hotels around the world. “Not only do fans want immersive experiences that they can share with people, but we saw in our TV shows that location itself is actually a major character. We looked at Airbnb and realised that people are going to new cities, and new locations, and experiencing things first-hand,” said Fulton. Nickelodeon worked to make this happen around the new Teenage Mutant Ninja Turtles film, creating the lair from the movie and listing it on Airbnb so that parents and children could come to stay in it. “We saw over 4m+ impressions over a month period. So this particular experience was a little bit more ephemeral. But we can see that we can use Airbnb as a native-advertising platform,” said Fulton. And as a business model, ultimately, for more permanent installations based on Nickelodeon brands. She added that with some parents still not entirely convinced of the benefits games can have for their children, creating shared experiences for parents and kids in the real world is an important part of Ubisoft’s strategy to win them over. These include a 3D theme-park ride starring Ubisoft’s Rabbids characters, as well as turning the waiting-lines for rides into mini-museums, with famous artworks customised with the Rabbids. There’s also a Rabbids-branded ‘Amusement Center’ playground for kids, and a 4D VR ride in Montreal. Fulton suggested that “millennials and Gen-Z want to spend more on experiences than they do on material goods” and agreed on the popularity of living out the experiences seen in popular shows. Hurford-Jones, meanwhile, talked about the BBC’s need to ensure that families find its immersive-reality genuine experiences, “not just a sales gathering” designed to sell merchandise. The panel were asked about virtual reality, which isn’t playing a huge role yet in these kinds of experiences. Not surprising, as most of the VR headsets aren’t recommended to be used by people under 13.